The complete guidebook to make quick cash when you need it most! Hello, I'm Tony Bass - the guy in the video broadcasting from the airport the other day. I know...seems kinda strange. I'll explain. I shot the video just before I conducted a transformational training program for owners of lawn and landscape companies. If you and I have not met in person...well...we need to. The fact is I've written 7 books for owners of lawn and landscape companies seeking ways to improve profits, productivity, sales and business value. I've had the honor and privilege to speak at hundreds of live seminar events across the USA and Canada. And that's why I shot the video from the airport. I was headed out to speak to a group of contractors at a live event in Calgary. I was on a very tight schedule...and that little video was published a week before we held the 24 Quick Cash Strategies Online Training event. If you are reading this, you missed the original live broadcast. But that's OK because we recorded the training event in entirety. 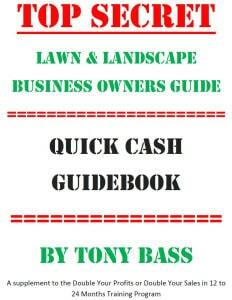 And just recently, we have made the Guidebook and Video Training available to owners of lawn & landscape companies. So...regardless of where you are located, the size of your company, the type of services you provide or how long you have been in business - you can get immediate access to the 24 Quick Cash Strategies and 4 HUGE Bonus Training Courses for one low price. Listen. Cash is fuel for your lawn, landscape, irrigation, tree service or snow removal business. Without CASH, business (AND LIFE) can be a real struggle. But when you unlock these 24 Quick Cash Strategies, your company begins a liberating transformation. You begin to move away from survival and you move towards financial freedom. The only reason I know how to teach these 24 Quick Cash Strategies is because I've used them in my own multi-million dollar landscaping business. Then...after I proved to myself they work, I began teaching them to other owners of lawn and landscape companies with 100% success along the way. So I understand what you're going through. It happens frequently... You run out of cash in the winter. Cash gets tight when you're growing in the spring. Cash gets short when labor expenses are highest in the summer. I can help you make these problems disappear with 24 Quick Cash Strategies. I strongly recommend you invest in your education. It will serve you your entire life...unlocking 24 sources of CASH whenever you need it. These advanced techniques have been used by business owners across America to raise their bank accounts to high five and six figure balances while leveraging internal an external assets that are typically overlooked an underutilized in lawn and landscaping companies.